The mic uses an ECC81 dual-triode tube in a class A amplifier circuit with a custom-wound nickel/iron transformer said to be “perfectly adapted” to the tube. The saturation of the tube is adjustable from a very clear to a high saturated and compressed sound. There is no risk of damaging the RM4’s ECC81 tube, as the voltage change is within the tube’s normal range of operation. The capsule is a large-diaphragm design that appears to be modeled to some degree after the Neumann K47. It is a dual-diaphragm, center-terminated design like the K47. Photos suggest that the RM4 capsule shares a backplate drilling style with the K47, in that the outer holes are equidistant from the center (forming a circle). However, unlike the K47, the RM4 capsule is a dual-backplate design, and at 32mm outside diameter is slightly smaller than the K47. The diaphragms are made of a 4-micron film metallized with a thin coating of platinum. Platinum is said to be lighter and more resistant to corrosion than gold. Both front and back diaphragms appear to be wired, although the mic has a fixed Cardioid pickup pattern. 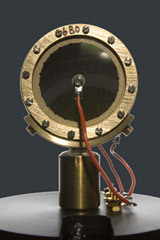 The RM4 capsule is similar to the capsule of the RM2J. It is manufactured in Germany, presumably by Haun/MBHO.